Giles A. Schinelli, Robert J. D'Aversa and Anthony M. Criscitelli were charged with conspiracy and child endangerment for allowing a friar who was a known sexual predator to continue working with children. 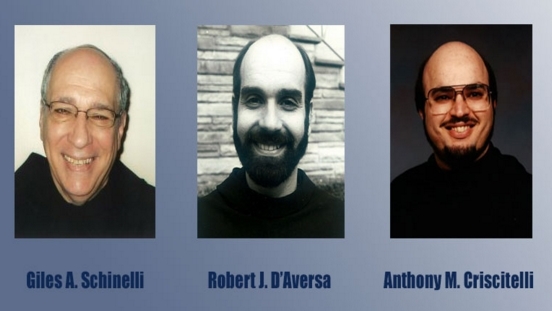 Prosecutors in Pennsylvania have charged three former leaders of the Franciscan religious order with conspiracy and child endangerment for allowing a friar who was a known sexual predator to work in a high school. The prosecutors say the friar had molested more than 80 children. Giles Schinelli, 73, Robert D'Aversa, 69, and Anthony M. Criscitelli, 61, were successively in charge of the Franciscan Friars, Third Order Regulars, Province of the Immaculate Conception in western Pennsylvania from 1986 to 2010. The three friars allegedly hid allegations of abuse against a member of their order, Brother Stephen Baker, who eventually pleaded guilty to molesting three boys in 2007 and served part of a 10-year sentence before killing himself at a monastery in 2013. After his suicide, more than 100 abuse claims were filed by former students of Bishop McCort High School in Johnstown, Pa., where Baker worked from 1992 to 2000, the Associated Press reports. Millions of dollars in damages have been paid out. "These men knew there was a child predator in their organization. Yet they continued to put him in positions where he had countless opportunities to prey upon children," Kane said when she addressed the media Tuesday to announce the charges. "Their silence resulted in immeasurable pain and suffering for so many victims. These men turned a blind eye to the innocent children they were trusted to protect." Schinelli, the minister provincial from 1986 to 1994, sent Baker for a psychological evaluation and was told Baker was not to have one-on-one contact with children, but nonetheless later assigned him to Bishop McCort, where he had regular contact with children. D'Aversa, the minister provincial from 1994 to 2002, allegedly failed to notify school officials and law enforcement of the reason that Baker was removed from the school in 2000. That removal followed what D'Aversa believed was a new, credible allegation of child sexual abuse, according to the grand jury. D'Aversa later appointed Baker as vocations director of the T.O.R. Criscitelli, the minister provincial from 2002 to 2010, further allowed Baker access to children by allowing him to work at a shopping mall. He also knew Baker required "safety plans" advising no contact with minors, yet Criscitelli signed such plans while residing in Minnesota. Meanwhile, Baker lived unsupervised in Pennsylvania. He also lived at one time with another accused child predator. The three former Franciscan officials live out of state and are expected to be arraigned in the coming days. The charges come from the same statewide grand jury that released a 147-page report two weeks ago alleging the Diocese of Altoona-Johnstown engaged in a widespread cover-up of sexual abuse by more than 50 priests and other church leaders. The Pittsburgh Post-Gazette says that the report resulted in no criminal charges of sexual assault "due to what prosecutors said were the time constraints of the statute of limitations," but that there was enough evidence to charge the three priests in connection with the cover-up.